This article is a step by step breakdown on how to allow multiple contact categories when registering a customer. Therefore, this means that you can register a customer as an individual type or a company or another type of customer that you can create. To learn more about contact categories, click here. Do note that in order to not receive any errors when using multiple contact categories, you have to make sure that there are no mandatory fields. To remove them, navigate to Settings > Car Rental > Default Values section. Next, remove any mandatory fields as shown in the picture below highlighted in orange. Next, navigate to “Driver Setting” section. Here, select “Yes” under “Enable Multiple Contact Categories” highlighted in orange in the picture below. Lastly, click on the blue “Save” button to save the changes. Now when you reach Step 4 (Customer Details), you will notice that there are two extra buttons as shown in the picture below. On your iFrame, your customer would be able to select to “Book as Customer” or “Book as Company” as shown in the picture below. Clicking on either will open the respective fields that the customer would need to fill out in order to head to the next step. 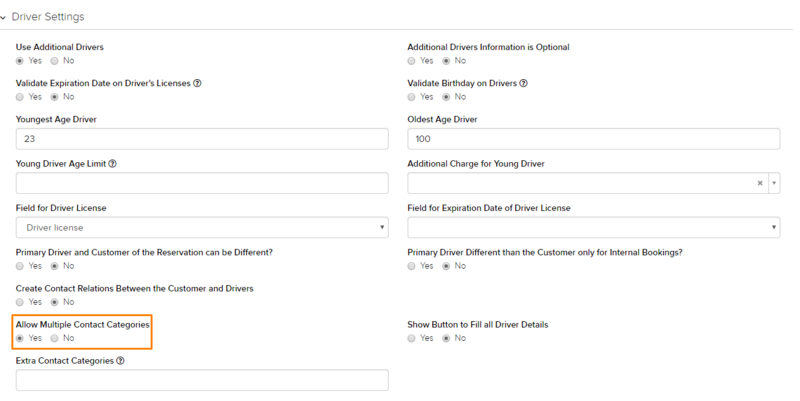 You can customize the form that the customers will see. To learn how to do so, follow this link here.